Georgia requires supervisors of food service establishments and non-retail food service establishments be certified in food protection. This means a person-in-charge, an owner, or manager of a food establishment – (i.e., restaurants, bars, cafes, bakeries, delis, mobile vending, food trucks, assisted-living, day care centers, and convenience stores) become certified by taking a approved food manager training course and successfully passing an accredited food manager certification exam. 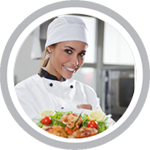 We offer online HACCP Training in Georgia for: Atlanta, Columbus, Augusta, Savannah, Athens, Sandy Springs, Roswell, Johns Creek, Albany, Warner Robins, Alpharetta, Marietta, Valdosta, Smyrna, Dunwoody, Mableton, Alpharetta, Avondale Estates, Johns Creek, and many more!